A prosperous AND ethical New Year to you all! We firmly believe that in the long run adherence to sound ethics will enhance prosperity - so let's take the sentiments of the headline forward into the new year with the wish that we can make it a great year for all. We're back in full action on 4th January. In the meantime we seem to have forgot to post our Christmas card to the blog! If you didn't receive it and would like to keep in touch with communications from us then just let us know. And rememember that you can also follow us on Twitter. How long is your supply chain? Two news items have loomed large for us in the last couple of weeks. One concerning the lack of ethical trading standards beginning in a supply chain close to home, the other aimed at clothing manufactured in Asia. Until 7 December 2010 you can view the episode of Channel 4's Despatches, "Fashion's Dirty Secret" on the "truth behind High Street Fashion" not at "a factory in the developing world" but in a factory in Leicester. In a further quote from the introduction "This is the dark side of cheap fashion". The factory concerned supplied New Look, BHS, Peacocks, Jane Norman and C&A. Is it news to these companies that they need to look further down the supply chain than their immediate suppliers, that there is such a thing as sub contracting? The answer is of course no, but it certainly seems to be something they need to pay greater attention to. It is no surprise that the offending firm Sammi Leisurewear, flouting the UK's minimum wage laws and paying cash in hand, has ceased trading. As an example of reaction, New Look told Despatches "New Look does not permit sub-contracting within its supply base and implements clear and direct guidelines to suppliers not to deal with unauthorised sub-contractors." That this goes on in the UK is surprising; you would expect local production to be better monitored; if clothes are being produced locally to be sold at rock bottom prices then should this not cause alarm bells to sound? The second revelation was in this weekend's Observer newspaper and highlighted a retailer that last year was ranked by Ethical Consumer magazine as the most ethical on the UK High Street. The Observer article writes: "Monsoon, the fashion retailer, proclaims its fair trade values, but its internal audits reveal concern at suppliers' failures to meet minimum ethical standards in India and China". In this case, amongst other ethical offences, the was the pariah of child labour - "children have been discovered working in its supply chain; women working from home may have been paid less than the legal minimum wage; some workers are regularly required to work excessive overtime; and conditions in suppliers' factories sometimes break both local laws and the industry's own ethical code". What is good here however is that it is not an Observer investigation that was required to reveal the abuses. It was an internal ethical audit by Monsoon's own people. Again there was sub-contracting. They would not have wanted the results of the report to be leaked but at least they were conducting their own monitoring in a way that refused to turn a blind eye. Monsoon highlighted how action was taken against the offending supplier and that that have "policies to sequester" children, "put into a care home" and "repatriate them to the family". Monsoon is a member of the Ethical Trading Inititive ("ETI"), an ethical code subscribed to by Monsoon - and indeed New Look. The ETI code of conduct, requires "the assumption of responsibility by an organisation for the labour and human rights practices within its supply chain". The problem with fashion is that its very nature means that you can expect some churn in suppliers. But it's very possibly pressure from retailers to supply more that causes a supplier who is meant not to be sub-contracting to do just that. At Pier 32 we are too small to have our own monitoring team. And we don't have to juggle suppliers - most of our clothing comes from Starworld whose factory facility (run by a company called Cotton Club) is closely monitored by the independent organisaton WRAP (Worldwide Responsible Accredited Production). We recently asked for and obtained a copy of WRAP's most recent audit report. We were pleased at the depth of the report and the findings that gave the factory a clean bill of health. In the context of the rest of this article we are particularly pleased to note that the report included the statement that the factory does not get help from sub-contractors to produce their products. So we have confidence that the Starworld clothing we supply is produced within a facility that is monitored and therefore meets the ethical standards that we would like to see. Something as mundane as the price of cotton rarely hits the news, but in the last week or so it has. The warning issued by retailers such as Primark and Next about soaring cotton prices has certainly hit the headlines. Next suggest that the price of cotton clothing will be 8% higher at the start of 2011 - part of this increase accounted for by the planned 2.5% increase in VAT. Since the price of clothing at Next is proportionately more than at Primark while the cotton content is broadly similar we could easily find a rather bigger percentage increase on the shelves of the country's favourite super low cost retailer. The increase in the price of cotton may lead to your typical teenager buying fewer t-shirts next year. That's a price to be paid. But when it comes down to it not a great price. How do we measure the price increase? Well 45% over the last year according to Next, but if you go back 15 years there has not been one! 15 years ago cotton prices were at the $1 per pound which sparked these headlines. While living standards and prices have forged ahead in western countries the price we have paid for cotton has fallen year on year and it is only the disasters that have befallen the cotton harvests that have caused prices to return to these previous levels. So what is the real price of cotton? In Pakistan and China floods have caused chaos, in the former in particular displacing the populations of whole towns and villages in affected areas. But even before the floods these people, as cotton farmers and pickers elsewhere, lived in considerable poverty. It's not easy to highlight particular exploitation in these countries but elsewhere we have highlighted the scandal of the government sponsored forced labour of the children of Uzbekistan in its cotton fields. At Pier 32 our Fairtrade options mean that you can have confidence that a fair price is being paid to the farmer. By buying organic cotton you will be buying from a different market - here supplies may not be affected as much and prices although starting at a higher level may stay more stable. Our Starworld range produced in Egypt is unlikely to be immune to the price increases but you can be certain that in 2011 it will still allow us to offer the great value clothing that we do now. London Fashion Week's getting ethical! There's no doubt of the importance of London Fashion Week. With the headlines being grabbed elsewhere by Lady Gaga clad in fresh filets, and at the fashion show itself by the stark naked models trooping down the runway for the the Designer Charlie Le Mindu's handbag and hat extravaganza, it may have escaped attention that on Friday there was a whole show given over to sustainable fashions. That such a show is a first is going to be a surprise to many but in fact ethical fashions have only previously been at the fringes of the event or indeed have had their own separate exhibitions at other times of the year. But this event was organised by the British Fashion Council as part of London Fashion Week proper and featured fashions by luminaries such as Stella McCartney and Vivienne Westwood and other lesser known labels such as Junky Styling, Henrietta Ludgate, Christopher Raeburn and People Tree. Behind it was The Princes' Charities Foundation and a programme called START set up "to promote and celebrate sustainable living". But also the British Fashion Council have an initiative called Estethica with 37 designers now signed up and adhering to at least one of the three Estethica principles of fair-trade and ethical practices, organic sourcing or use of recycled materials. All are selected for their ethical credentials and design excellence. There are those who decry fashion and argue that sustainable fashion is a contradiction in terms. Such individuals will be thinking of the throwaway end of the market for the reality of most medium to high end fashion is quality fabrics which mean that if owners choose to keep their clothing then it will be around and wearable for many years to come. Indeed the new 'Vintage' movement exemplified in the mainstream by the recent and first Vintage at Goodwood festival points to a new value being placed on quality labels and eclectic or classic styling from all eras. Of course quality fabrics do not necessarily mean that the clothing has been ethically and sustainably produced - but a throwaway tag is a perfect excuse to sidestep ethical considerations and the prices one sees attached to some clothing makes one wonder how the clothing can be produced without some major exploitation of people or the environment along the way. Our promotional clothing range includes garments that may not be the cheapest, but come close. However they do have a level of independent certification that means that you can buy ethically with confidence at a great value price. We'll concede that you're not likely to see them at London Fashion Week but look a little deeper into our catalogue and you will find some great stylish clothing, and of course ethical too! Win an Ethical Organic T-Shirt - first numbers now drawn! 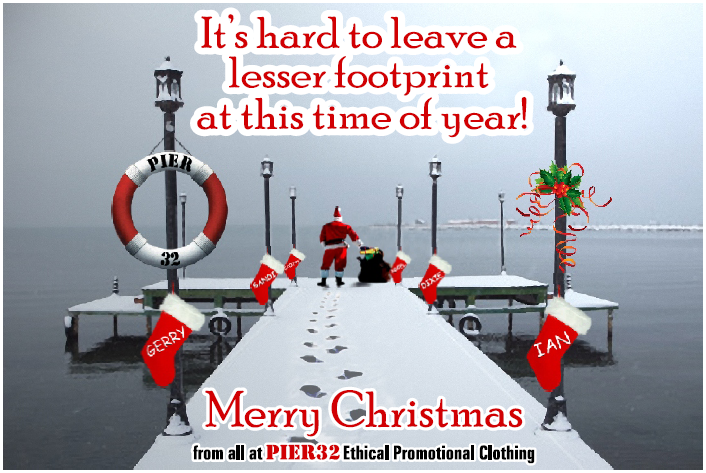 You may have noticed the new banner on our home page - from this week, on selected orders of WRAP ethically produced t-shirts, we have been attaching Pier 32 tags that carry a unique number. Starting this week too, and every week for the next 52 weeks, three numbers will be published on this site each week and if one of those numbers matches the tag in your WRAP clothing then you win a ethically produced, WRAP certified, organic cotton t-shirt. Remember to keep these Pier 32 tags and check back in the weeks ahead - if not a winner yet, you could be soon. An update on the excellent Ethical Fashion Twitter feed alerted us to a big development at M&S to push ethical fashions to the forefront with a new £200m ad campaign. You can read more at a Guardian story where you can also see some ad copy which pushes Plan A as "Doing the Right Thing" making the point "For some retailers, green went out of fashion as soon as it came in". Our initial thought is that this 'pop' at its competitors might signal that for many retailers ethical clothing was 'in' in the good times, and now we are embarking on a age of austerity it's quietly being forgotten about. And that is indeed the point which M&S are making. Steve Sharp, executive director of marketing at M&S is quoted as saying "Without being specific there are plenty of companies that have jumped on the bandwagon but have not really committed or are [not] delivering". The Guardian states M&S as having so far achieved achieved 39 of the 100 commitments outlined in Plan A, a five year plan launched in 2007 to transform M&S's ethical credentials. M&S itself in its 2010 annual report says it's met 62 of the original 100 ethical and green commitments and added another 80! The 'Grauniad' seems to be counting backwards - make sense of the figures and the efficacy of the commitments for yourself here. We think it's great that ethical issues in clothing are going to be out there in a big way in adverts everyone will see over the coming weeks. Whether for your own back or for a promotional campaign (that's where we come in!) making ethical clothing as part of the choice is going to be there for everyone to think about. As we head into the teenies (and the decade hopefully will not turn out to be known by that name!) it's useful to look around the market place to see further sign of the market for ethical clothing developing, and for pointers on whether abuses in the clothing industry are on the way out. The promotional clothing market itself is likely to follow trends rather than set them. To see where the future heading it's the likes of independent fashion clothing brands that are likely to be setting the pace. For example, Fashion United reports the trade fair for independent brands, Margin, in London attracting major international retailers alongside the leading independents you would expect to see. Major stores attending Margin included House of Fraser, Harvey Nichols, Liberty, Top Shop, Next and Fenwick, as well as online retailers such as ASOS and Coggles. The article particularly highlights an increase in these visiting stores interested in fair-trade and organic clothing with correspondingly more ethical fashion labels such as Frank & Faith showcasing their products. In fact Frank & Faith said "we may be an Eco fashion brand but we want our ethics to be the norm not the exception.... .....we were opened up to great boutiques, buyers and press who just loved us because we are a great indie fashion brand with soul". The main London fair specialising in ethical clothing is Pure, that's some way off yet but their main sponsor, the Ethical fashion Forum is busy around the year and on Twitter they provide a constant steam of titbits (my preferred name for tweets) highlighting the progress being made in the industry. Something that caught my eye was the reference to a blog article by Jamie Burdett reporting on the DEFRA Sustainable Clothing Roadmap conference and shown there, a new machine in production soon to new machine to separate waste textile and create new thread even from short fibre denim, apparently prompting "the man from Tesco to say, 'we'll buy that from you tomorrow!'". Unfortunately there are some who do not seem to get the point with the minister from Defra quoted as saying, 'lovely to see so many brands here today, although one is clearly missing, Primark'. Yesterday's news alert from Business Trading Ethically unfortunately finds it necessary to highlight the other end of the spectrum, referring a new report by the Environmental Justice Foundation labelling Uzbekistan a "Slave Nation" - the government there "continues to lie to the international community while routinely compelling hundreds of thousands of children as labourers in the country's annual cotton harvest". We reported on the situation in Uzbekistan two years ago - it seems that little has changed. On the theme that every News Alert should have a silver lining, BTE also reported that Ben & Jerry's would be 100% sourced from fair trade certified products by the end of 2013. Can't wait! We've been pushing forward with our contacts in the music industry recently - the conciousness over ethical t-shirt printing decisions is as big here as anywhere and we want to be at the forefront of people's thoughts when it comes to purchasing decisions because, putting it simply, we think that our t-shirt printing provides the best combination of value with ethics in the business. 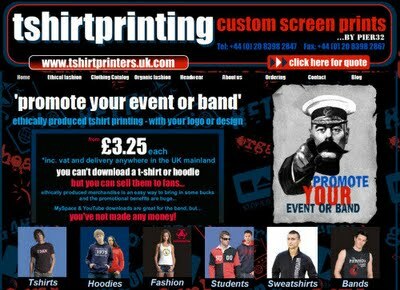 This is the new look of our sister site tshirtprinters.uk.com - aimed squarely at this market. Already, in the middle of this wet winter, the music airwaves are buzzing with news of who's going to be appearing at which music festival this summer. One thing you can be sure of is that Pier 32 are going to be there in the mix. For example, last year our client Hotbox Events ran volunteer teams of people of between 450-500 at the Reading and Leeds festivals, and 250 at the Latitude festival in Suffolk. Every volunteer was given a Pier 32 crew t-shirt, and each member of staff a Pier 32 t-shirt and fleece. 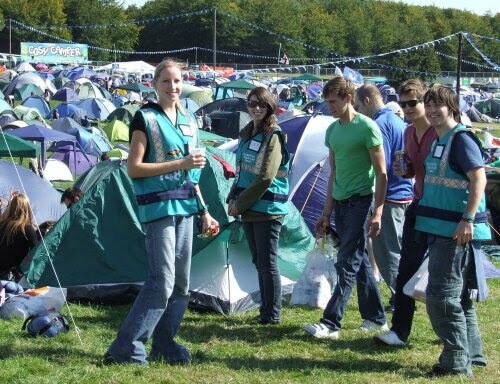 Hotbox Events works with Festival Republic recruiting and managing staff and volunteers for festivals pulling together Campsite Assistance Teams (CATs) and Helpful Arena Teams (HATs) at the Reading, Leeds and Latitude Music Festivals since 2003. The CATs and HATs work in the campsites and arena, helping the festival goers to get the best out of their weekend by providing directions, helping to carry belongings and putting up tents, reporting back regarding any problems and working with fire safety, medical and security teams as required. In 2009 Hotbox was looking for a new supplier to print the t-shirts and embroider the fleeces. Hotbox wanted to go ethical with both material and production, although they also needed to stick as close to the 2008 budget as possible. This was not on the face of it an easy task but they made the right decision in contacting Pier 32 and our broad range of ethical t-shirt options fitted the bill precisely. "Pier 32 worked tirelessly with us in 2009 - it wasn't an easy task for them as we needed numerous logos in specific colours and shirts and fleeces in batches of very specific sizes. Pier 32 managed to produce the orders to budget, and the shirts and fleeces arrived on time and looked great! We really appreciate the effort and will be back for more in 2010!" Hotbox Events is a trading name of Hotbox Studios Ltd.